P&Z approves housing development at 500 Main St.
WESTPORT — The Planning and Zoning Commission approved a housing development for 500 Main St. ending a months-long saga in which the commission denied one application for the property, sending the developers back to the drawing board to come up with one the commission would approve. The resulting proposal, brought by Mel Barr of Barr Associates, LLC, on behalf of the developer Peter Greenberg of Able Construction, includes two two-family homes and five one-family homes on the 2.18 acre lot at 500 Main St., the location of the former Daybreak Nursery. In a 5-2 vote, Commissioners Michael Cammeyer, Paul Lebowitz, and Greg Rutstein voted in favor of the proposal with Alternate Commissioner Jon Olefson, who filled in for standing Commissioner Danielle Dobin, also voting in the affirmative. Commissioners Alfred Gratrix and Chip Stephens voted against approving the 500 Main St. development. Over the years, the commission has said it wants to increase the amount of smaller housing for older people who want to downsize from larger homes, Walsh, perhaps the Commissioner most in favor of the proposal, said. The commission steered Greenberg to propose a small housing development for persons 55 and older and therefore the commission should approve his proposal, Walsh said, adding that Greenberg complied with all of the commission’s demands for the application, even downsizing the project from 12 to 9 units after the commission denied Greenberg’s first application in March saying it preferred a smaller and less dense plan. “To me this is ghettoizing Westport,” Stephens, who voted against the proposal, said. The second proposal was still too dense and put too many homes on a small property, Stephens said. Gratrix, who also voted against the proposal, cited his concern for potential environmental damage from 11 new septic systems to be placed on the property as included in the proposal. Although the property sits at the busy intersection of Weston Road and Main Street, Commissioner Rutstein said approving the property would not preclude the state, which owns the intersection, from implementing fixes, such as a series of roundabouts, to ameliorate the traffic and safety concerns at the intersection. “I think this would be a beautiful gateway to Westport,” Cammeyer said of the housing development, which would replace a now-vacant plot of land abandoned by Daybreak Nursery when it went bankrupt a few years back. 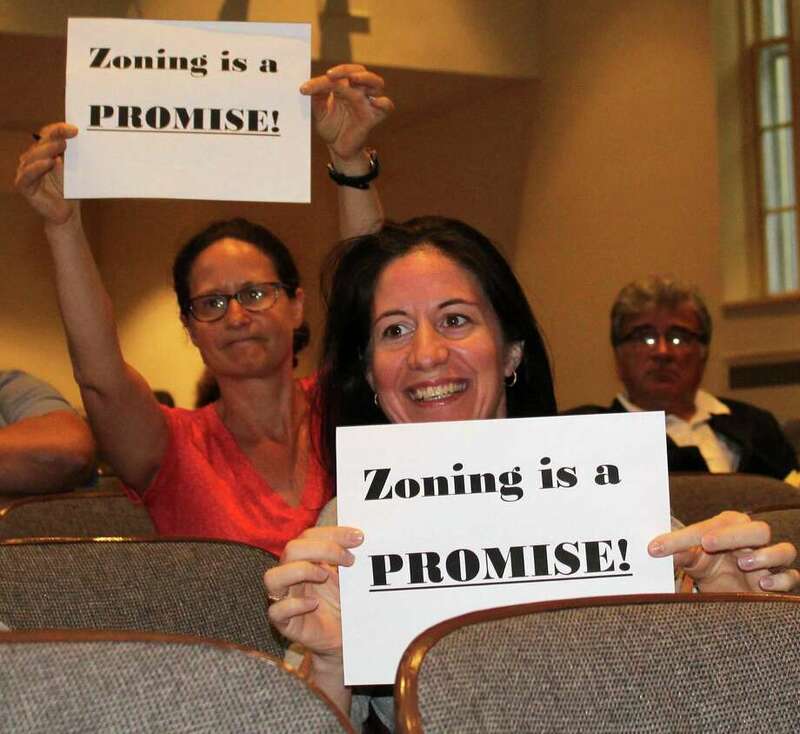 Several of the surrounding neighbors sat in the audience holding signs that read, “Zoning is a promise,” a nod to their past frustration with the introduction of a dense development in a neighborhood that, except for the plot at 500 Main St., is zoned only for single-family homes on sizable plots. “Today they voted against the expressed wishes of Westport residents, against the environment, and against public safety. The only winner with this decision is the developer, and his associates who will triple their profits,” Daybreak Lane resident Bonnie Dubson, whose property is close to 500 Main, said.